Change notoriously happens slowly in Japan, so it is probably just as well that Sarah Whitley, the head of Baillie Gifford’s Japanese team since 2001, has been following the markets there for so long. 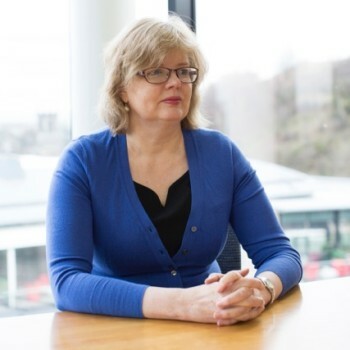 With more than 30 years experience, she reckons she is now one of the longest continuously serving fund managers working in the UK. Her funds have ridden the highs and lows of the Japan roller-coaster over the last 30 years with considerable success, consistently outperforming the main indices and her Topix benchmark. I met her in Edinburgh to find out whether she thinks this year’s sell-off in Japan is a foretaste of further trouble ahead. (Disclosure: I am a shareholder in the £350m Baillie Gifford Japan Trust, which also features in the Money Makers core managed fund portfolio). After years of disappointment, repeatedly raising and then dashing hopes of a permanent recovery, the Japanese equity market went on a tear with the rise to power of Prime Minister Shinzo Abe, elected in December 2012. But since the start of last year the momentum has faltered, amidst doubts about the success and sustainability of his “three arrows” reform programme. The Bank of Japan’s foray into negative interest rates earlier this year, the latest move in its campaign to throw money at Japan’s entrenched deflationary mind-set, was given a particularly dusty reception by investors, leading to sharp falls in both the equity market and the Japanese currency. So, I ask Sarah, the obvious first question is: has Abenomics run its course, as some commentators have suggested and we are back on the familiar old see-saw ride in Japan? She says not. She attributes the sharp sell-off in Japan in the first quarter to a combination of global concerns (about recession, interest rate rises in the States and so on) and a reaction to the shock of the BoJ’s negative interest rate decision. “I think the policy unsettled people, because there was a view that if the government needed to go to negative interest rates, something really bad must be about to happen”. Volumes in the money markets initially collapsed and the media was full of stories of people rushing out to buy safes and hoarding more cash. But those initial reactions are now reversing, she notes. Money markets have recovered. Orders for rental housing, a traditional way for investors to save on inheritance tax in Japan, have picked up as well. Some big corporates have been quick to take advantage of the interest rate move, with Toyota issuing a five year bond on a yield of 0.04% and a three-year one at just two basis points – nice work if you can get it. (“We would love to issue such things for the Baillie Gifford Japan Trust, but sadly we can’t!”). There is also speculation that the Ministry of Finance will shortly issue a whole bunch of perpetual zero coupon bonds – in effect permanent zero cost government borrowing, the ultimate symptom (or absurdity, some might say) of a zero interest rate world. So yes, says Whitley, people worry about the debt problem in Japan, but with 10-year Japanese Government bonds also now offering negative yields, “people are paying the Japanese government money to lend them money. So they are not that worried about what is happening”. Clearly she doesn’t think that the market sell-off is a warning that the latest cycle in Japan has reached a break point? “No, I don’t. You know, if in the Western press you get a headline saying “has Abenomics failed?”, then the answer is going to be yes”. But a more nuanced answer would be “well, some things have been very successful and some things haven’t worked at all. But that is not what people want to hear. They want a binary answer”. Foreign investors have long been the marginal buyers and sellers of Japanese equities, and their knee-jerk response to the prevailing story of the day tends to accentuate movements in the market indices. She gives three examples of important recent progress. One is the growth in tourism, which the prime minister Mr Abe made a key policy target when he unveiled his Abenomics programme. The aim was to get 20 million tourists by 2020; that number was effectively reached in 2015, five years ahead of schedule. The numbers of women moving into the workforce has also been a striking success. A third notable development is a change in regulation of new medicines. “If you can prove that your new drug is safe, in Japan you can now sell it to anyone who will buy it. You don’t have to prove it is effective, which is quite an interesting way of doing it”. Her point is that to focus on the headline issues of structural reform and monetary policy is to miss the many smaller changes which are taking place at the margin and it is the cumulative effect that is beginning to make a real difference to the way that Japan operates. In her view, the deregulation is probably more important in the long term than the success or failure of its shock and awe monetary policy. The key achievement on that front, she says, has been to get the yen back from its crippling earlier rate of 80 to the dollar. “Things work back to front in Japan. 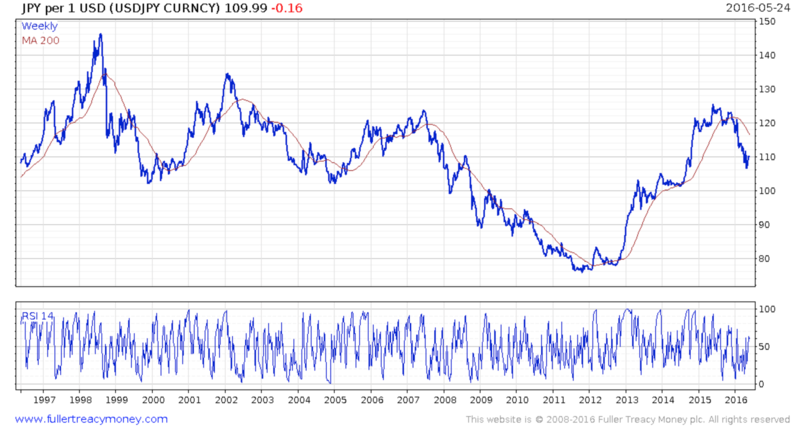 So when people worry about Japan, the yen strengthens. 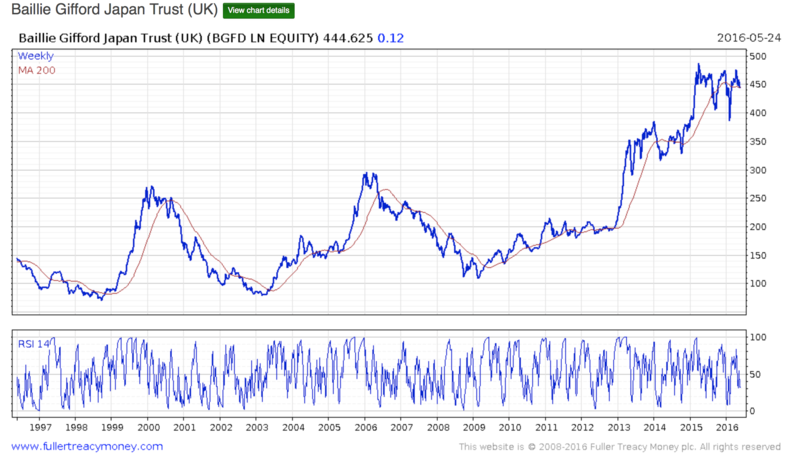 When people worry about the UK, the pound weakens, but in Japan it’s the other way around. So at times of despair, the currency is fantastically strong. And that’s not very helpful. 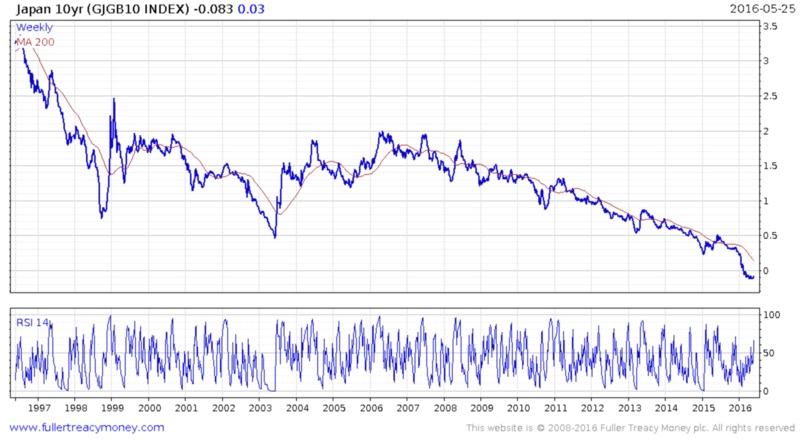 The yen at eighty was deeply unhelpful and was beginning to lead to serious hollowing out of manufacturing”. But now, “while the financial markets are incredibly sensitive to movements in the yen, in real life it does not make much difference whether the yen is at 105 or 120 to the dollar”. While reported profits for Japanese exporters in the first quarter were inevitably down because of the recent strengthening of the yen, few companies were basing their pricing on the lower rate and, she says, there is no suggestion that the recent moves have damaged the long term competitiveness of Japanese companies in a way that the yen was doing when it was at 80. What about inflation, I ask, noting hedge fund manager Hugh Sloane’s recent observation, in his recent Money Makers interview, that the only inflation measure in Japan which is not picking up is the one that the Bank of Japan happens to be targeting? Whitley is inclined to agree. The GDP deflator is positive and nationwide CPI excluding food and energy has recently topped 1% per annum, a seismic move in Japanese terms. Is it a big deal? “Yes, although I still think consumer psychology is still not yet set for inflation. We need a longer period of inflation for that to change. But I am sure we will get there eventually”. More important still for a fund manager investing in Japanese equities is the change in corporate governance and corporate behaviour, where although the new governance code only came in last year there have already been some huge changes– more share buybacks, more dividends – already taking place and more to come. “Looking forward, you have to think that things will be quite different. It is as if the market suffers from ADHD [attention deficit disorder] or something, loses the plot and says that nothing’s happened”, when in reality it has. Yet there are lots of little stories that testify to fundamental change in corporate behaviour. She mentions the retailer Seven and I Holdings whose boss has just been ousted for being “too dictatorial”. Companies which finally appoint a professional CFO (Chief Financial Officer) are of particular interest to the Baillie Gifford team. As has been widely noted elsewhere, Whitley’s view is that there is “massive scope” for improving capital efficiency, using the balance sheet as a tool for growing a business, rather than simply an accounting outcome. Investors are too quick to extrapolate from single examples of poor governance, she says. Mitsubishi Motors for example, which had an uncompetitive car in the mini market, recently admitted that when given an unrealistic sales target by its CEO, management had simply (and “rather pathetically”) made up the figures. But “we always thought that Mitsubishi Motors was a bad company and it’s still a bad company. My point is that nobody thinks all German companies are bad just because VW does something really bad, but in Japan they do. It quite an odd way of thinking. I think there’s actually more difference in corporate culture in Japan than in other markets, because you get some companies that really get it, and are trying to grow to reward shareholders, and some that don’t”. Her point again is that outsiders are too quick to generalise about Japan, which of course is precisely what makes the country such a potentially profitable hunting ground for stockpickers, especially those who have been doing it for years. 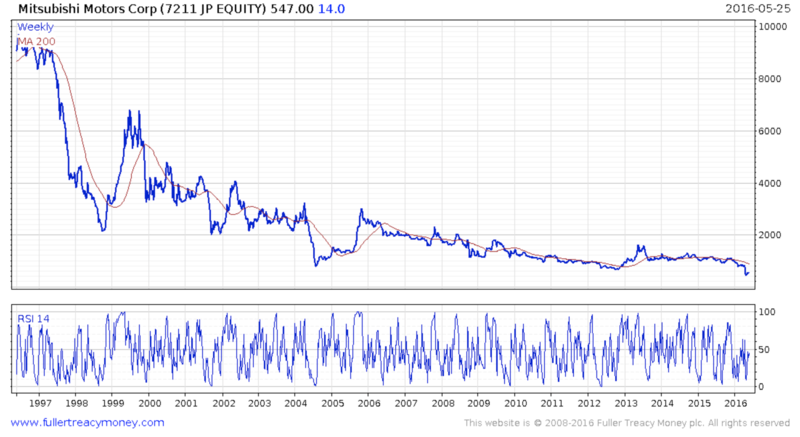 The Japan market remains cheap both in absolute and relative terms. How cheap, I ask? While there has been “a huge expansion in multiples for stalwart defensive stocks, just as there has been in the rest of the world”, she says, many other stocks are dirt cheap – some deservedly so, others not. In her investment trust, Baillie Gifford Japan Trust, for example, about a quarter of the portfolio is in cyclical growth stocks, and the vast majority of them are trading on single digit P/Es. Whitley reels off a string of names and multiples, including Mazda (7x), Isuzu (7x), Itochu (6x) and Sumitomo Mitsui Trust (on 0.6x price to book). The secular growth bucket, which makes up just over half the portfolio, meanwhile has “a category of stock that so far we don’t think exists anywhere else, which is the value internet stock!” GMO Internet for example trades at at a near 40% discount to the value of its quoted subsidiaries. Overall, compared to the Topix index, the portfolio has a similar earnings yield, but much higher return on equity and sales growth. After going through these and other holdings, I return to the macro outlook for Japan. “I think it is going to be dull, to be honest” Whitley says. “Japan people talk about the lost decades and so on, but GDP per capita actually held up very well until the global financial crisis. In some ways it has been better than the UK, just not that exciting. And of course people say ‘but compared to China….’. Yes, but China today is like Japan in the 1960s, when Japan was a great growth economy and it leapt forward amazingly in wealth. Now it is not, because it has reached a different stage. It has got an aging population and they’re grappling with issues about immigration and beginning to take it a bit more seriously. It is not accepted yet, but I am sure they’ll get there in five years’ time”. Why? “Because they’ll need to”. So Japan is not a country that is facing an existential crisis, as Kyle Bass and other high profile investors have claimed? “No. You could argue that life has been too comfortable in Japan, but I don’t think crisis is right. They do want to produce inflation and deal with the inflationary mind set. Obviously that has proved much harder to eliminate. It has not been helped by the oil price plummeting and so on”. But it will happen. What about the second controversial consumption tax increase that is planned for next year, I ask? Will it happen? Whitley says she does not know – although one strategist she talks to says there is a 90% chance it will be postponed – but then surprises me by saying that in any event she doubts that the government needs it. Why, I ask? Because, she says, the outlook for tax revenues is much more robust than many people, looking just at the country’s historical notoriously low tax take, imagine. A new tax system, known as My Number, will pull thousands of self-employed in Japan into the tax net for the first time. On a five-year view, the Bank of Japan expects that the new system on its own could return the country to a primary fiscal surplus by 2020. The government deficit meanwhile is coming down and while clearly heavily indebted, “Japan is also the largest creditor nation the world’s ever seen and has far more assets overall than government debt”. Unlike the UK, it even has a funded public sector pension fund – add that back into the numbers and Japanese debt would “look quite small in comparison to ours”. Inflation, if or when it comes, will also eat away at the debt burden. So things really are changing, she concludes. “One of the things that you can take from negative interest rates is that they really mean what they say and they will try things and keep on trying. They are not going to throw in the towel. They haven’t cracked the deflationary mind-set, but I am not sure that any central bankers really know how to deal with deflation. There isn’t a book on that”. And meanwhile the equity markets remain both cheap and under-researched, making them one of the better hunting grounds for those, as Whitley does, who have the advantage of having toiled away for years in both bad times and good and now have the results to prove the value of that experience. 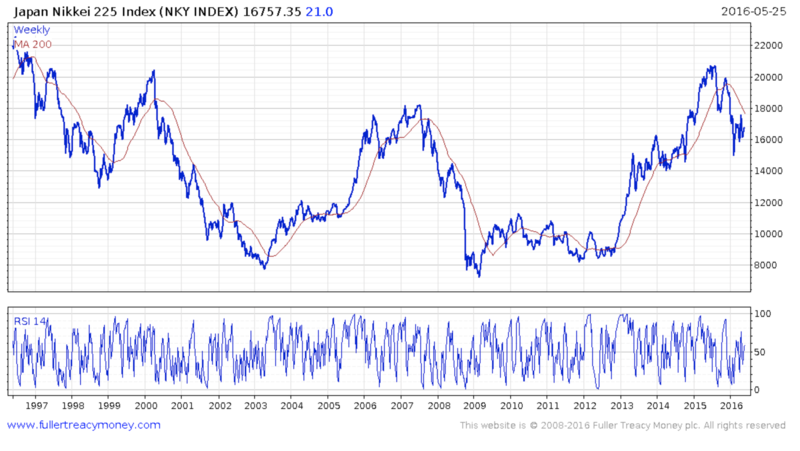 For my money that makes Japanese equities still one of the most attractive places to be overweight right now, although the indices will remain vulnerable to the fickleness of short term foreign investors trading in and out, as they have always done. The main panel of each chart shows historical values with the addition (lighter line) of a 200-day moving average to highlight the medium term trend. The bottom panel shows the RSI, or relative strength index, a standard measure of whether a series is “oversold” or “overbought” on a short-term basis. The scale is 0-100: a reading above 70 is typically taken to indicate a poor entry point (“overbought”) and one below 30 an attractive entry point (“oversold”).